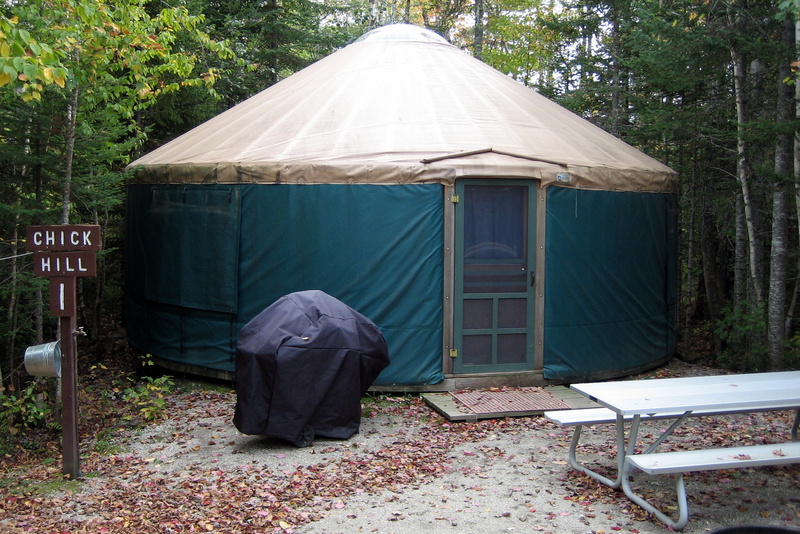 They are made of expandable wood lattice and waterproof fabric with a dome skylight at the peak. They are surprisingly roomy and have all the comforts of home. On the way down to the Airline we came across a fawn that was having breakfast in an overgrown graveyard. It spooked and bolted into the woods as we trundled past. 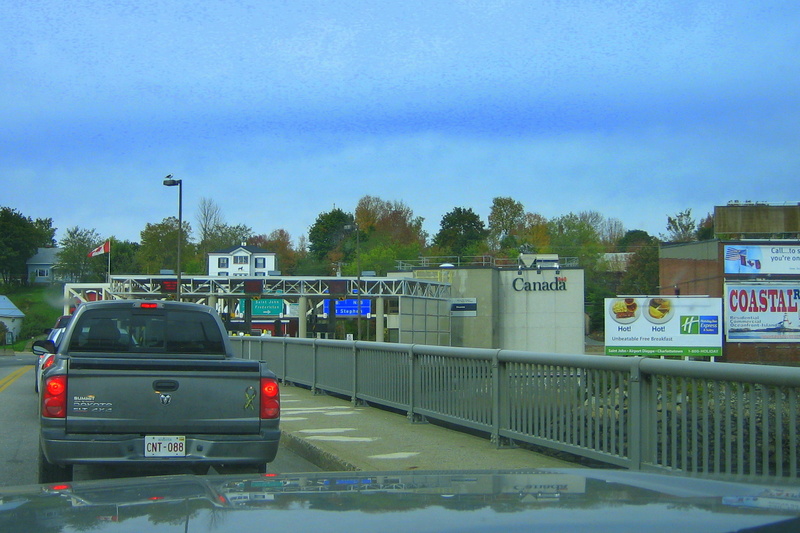 Jumped on US-9E toward Calais where we stopped at “The Wall Mart”…..just in case there are no stores in Canada. Kit shopped while Bill took walking laps around the parking lot. 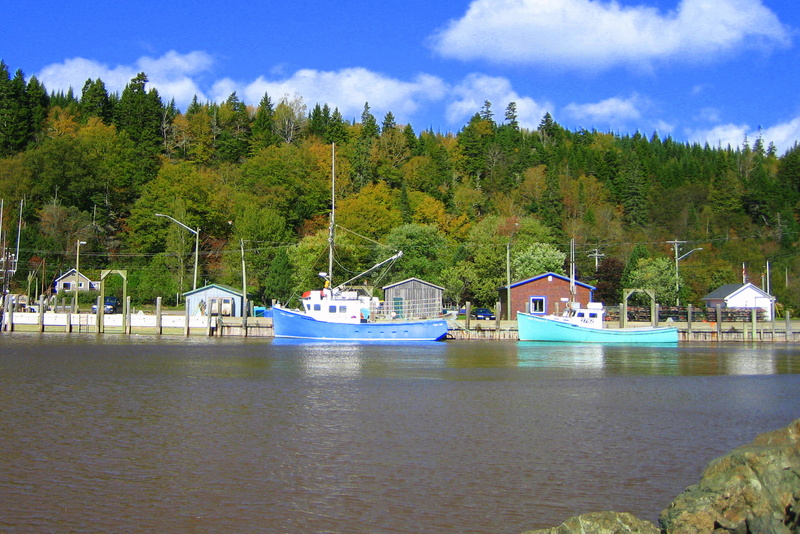 We crossed the St. Croix River into Canada at 1345…..
…..opps, it is now 1445; what the heck! Atlantic Time Zone!!! Just got into this country and already we are an hour behind our very rigid itinerary. Guess we will have to step on it! Fortunatly the speed limit sign read 110…..tried to get to 110 but I was flying past other travelers so I decided to just go with the flow of traffic. It took us only 45 seconds to clear customs…..after waiting 15 minutes in line. All and all, not bad. We stopped at the visitor center to pick up information, maps, brochures and an English to Canadian Translation Dictionary. Took NB-1 to NB-111 toward St. Martins. Roads a bit rough but we’ve seen worse…..at least it was paved. Stopped for fuel at an Irving station. I needed gas but all they had was petrol…..hope it doesn’t damage my engine. However it was only was only 97 cents! WOW….I love Canada. What the heck!! What’s a liter? Drat! Pulled into the pretty coastal town of Saint Martin about 1630. Decided to stay in the only campground open this time of year, The Seaside Tent and Trailer Park. It is owned by a very nice local couple by the name of Mike and Gwen who we hit it off with right away. They proceeded to tell us all about their town of 380 souls and what to see and do. 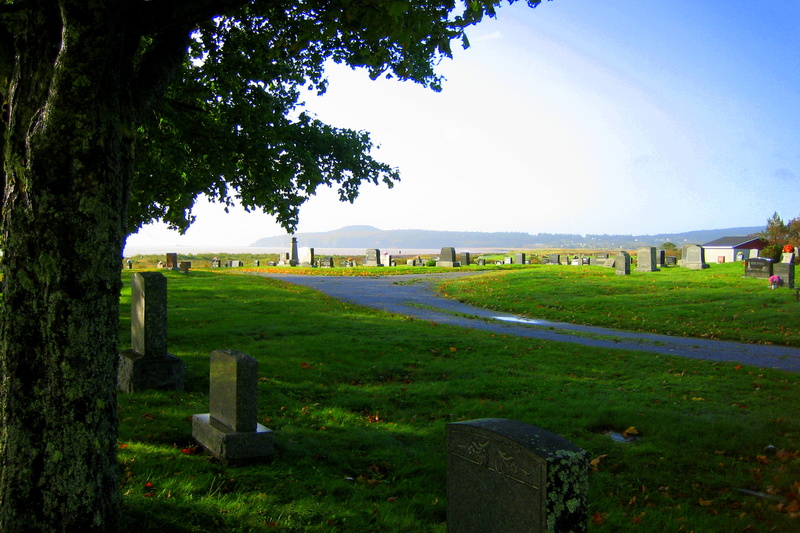 We had a nice site with a view of the ocean…..if you looked over (and overlooked) the cemetery next door. Those dead folks had the best view. The cemetery was the only one in town and was the final resting place for the various ship captains, masters, ship wrights and seaman from the area. There were grave sites from the 1700’s that were etched with nautical scenes. It was pretty fascinating. A very short walk to the end of the campground there was access to a very nice 2 mile beach that fronts the village of Saint Martin. 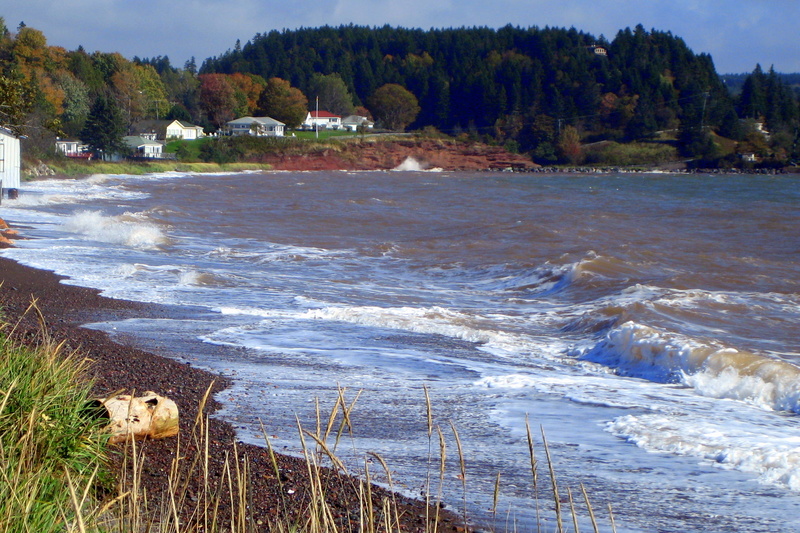 Well…..it’s more of a beach at low tide. Thursday, October 07, 2010: Woke early after a very restful sleep. I took a walk on the beach while Kit spent another hour checking her eyelids for holes. 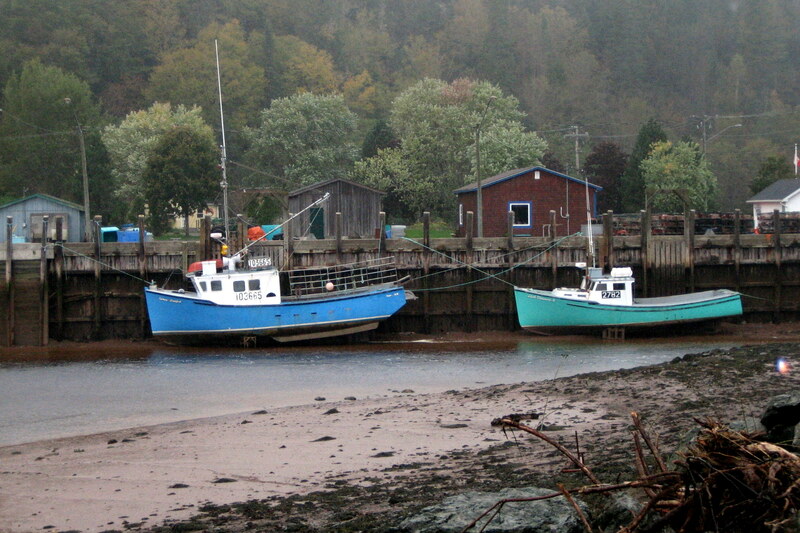 There is a Scallop Dragger out of Digby, Nava Scotia that went aground down the beach a few nights ago. Mike tells me it began taking on water so the crew steered for shore. The good news is that they successfully grounded the vessel and all 3 crew members safely abandoned ship. The bad news is that this was during low tide which in these parts is 33 feet below high tide. So the dragger sits, full of silt and underwater for about 20 hours a day. The owners have abandoned all salvage rights so it will quietly rust in place. At this tide I could barely see the mast and part of the deck. We originally were only going to just stay overnight but the campground was so nice, the area had so much to see and the local folks were so friendly we decided to stay another day. So Kit walked down the main drag to explore and ended up at the library. Bill returned to the shore where he walked all two miles of the sandy beach and there was a lot more beach to walk thanks to the low tide. Picked up some sea shells, a few pieces of drift wood and some pretty rocks. Gotta love the pretty rocks…..the cheapest souvenirs. Since I had plenty of beach and since the wind was blowing strong I brought my kite out to play. Actually I have acquired two kites over the past year; a quad line performance stunt kite and a two line parafoil power kite. It was this last kite I chose to fly today. I was having a blast as the high wind made the kite really fly and the pull was strong enough to drag me across the sand. A couple of times I had to dump some wind before I literally left the ground. Putting the kite away I went hunting for Kit when I came upon the village museum. They weren’t open but as I was looking in the window the curator drove by, stopped and offered to open the museum for me. I gladly accepted and received a guided tour of the collection. They even have an impressive presentation on the new Canadian Frigate that the company I just retired from is supporting. 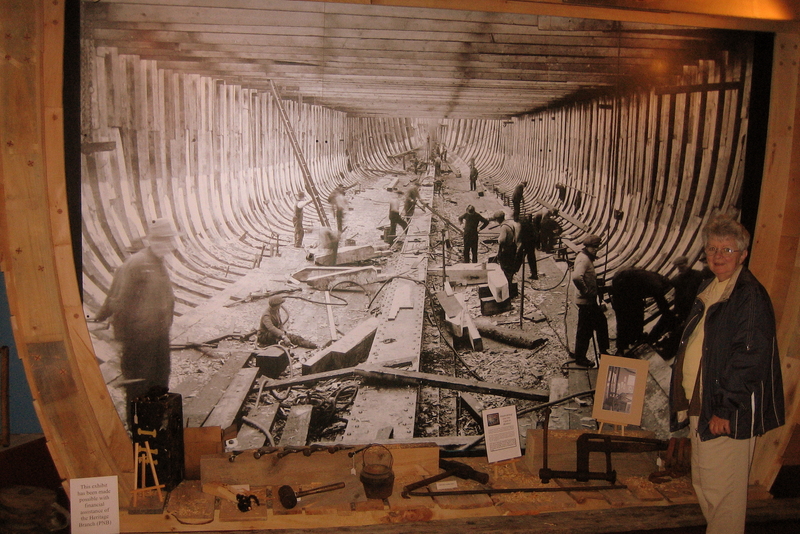 In addition they had an extensive display of maritime history chronicling the some 500 sailing ships that were made in the village over the years. 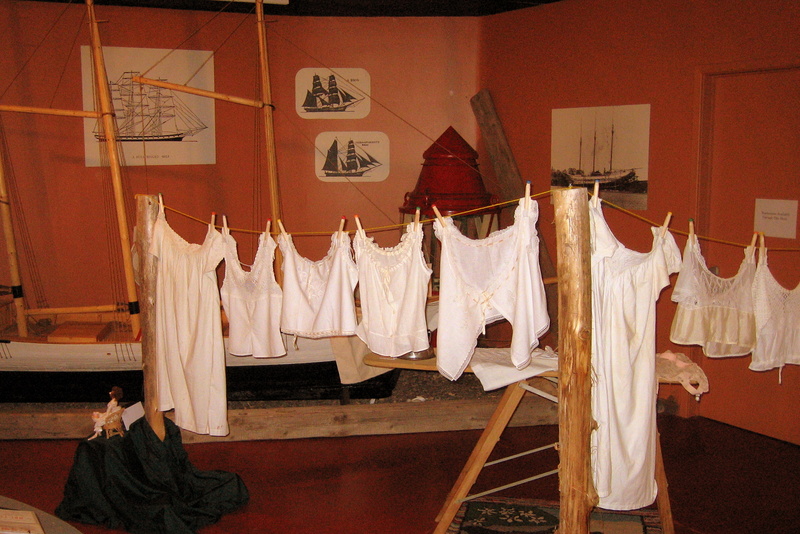 In addition there was an impressive display of early women’s underpants. Leaving the Quaco Maritime and Underwear Museum we decided to drive “The Fundy Trail” which meanders along the highlands east of town. They road was steep and serpentine but very well maintained. Of course we have Mr. Bill along as usual. He will keep us safe from peril and from the dastardly deeds of Mr. Hand. 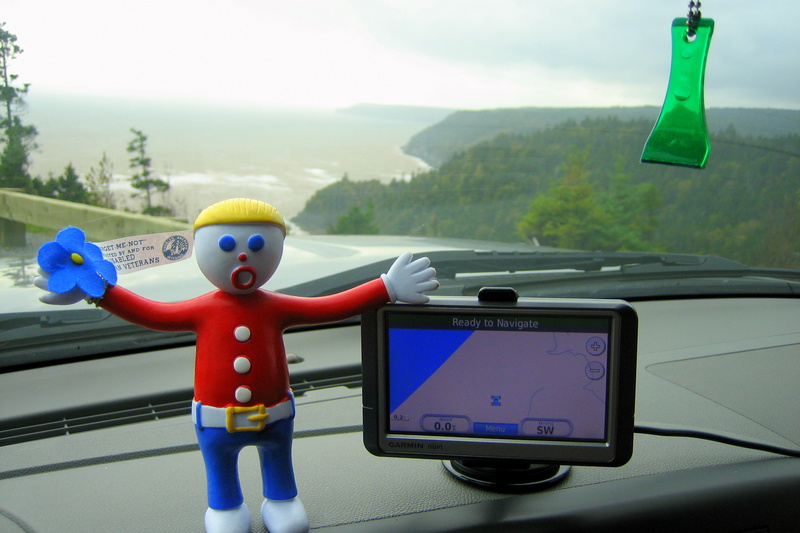 However about Lucy…..notice the GPS screen? 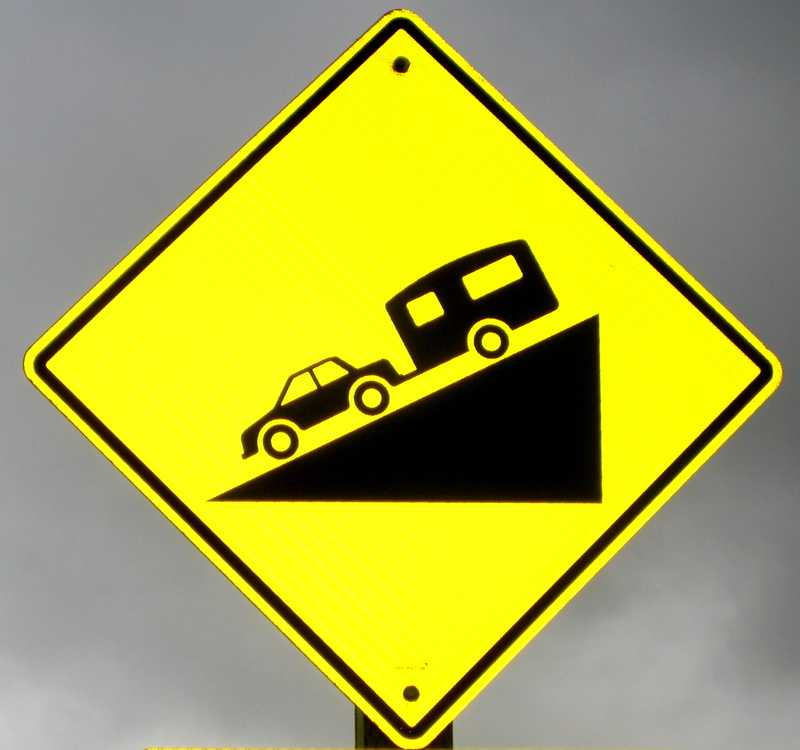 The little blue truck icon isn’t on a road…..Yikes. 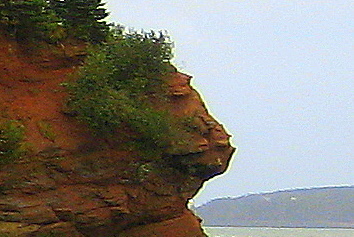 Driving along ‘The Fundy Trail” we stopped often to look around and snap a few pictures. It was a crummy day and was spitting some rain but the views were fantastic anyway. Took a break at the visitors’ center for a snack and to learn about this engineering feat. The road was originally put in by the Pejepscot Paper Company to access logs that had been cut on the highlands and floated down the Salmon River. When the paper company abandoned the area the province of New Brunswick restored and improved the trail. 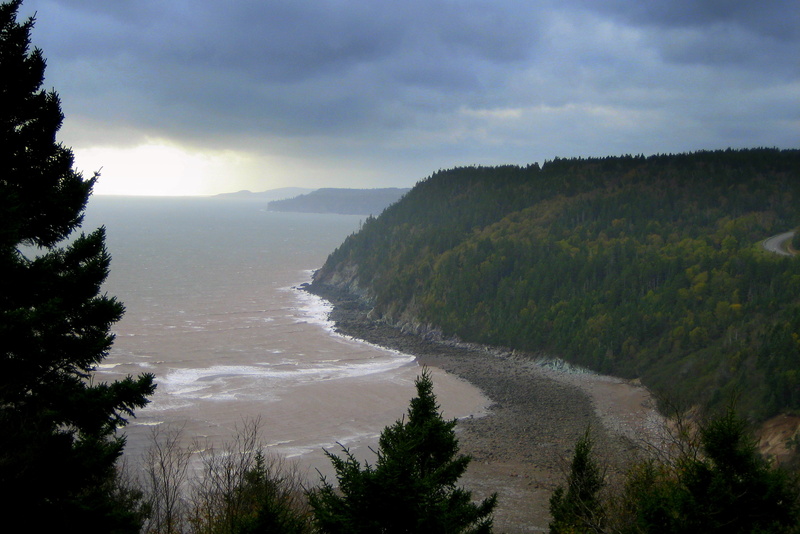 The locals brag that “The Fundy Trail” rivals “The Cabot Trail” up on Cape Breton. 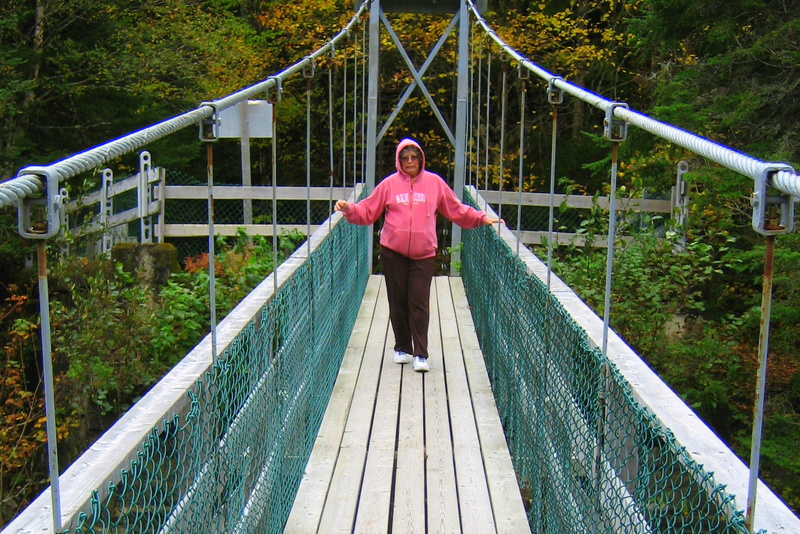 Kit and I took a walking trail down to the suspension bridge that crosses the Salmon River. The span swings and bounces as you make your way across the swiftly flowing river. Back in Saint Martin we stopped for a bowl of great seafood chowder and to await low tide so I could walk out on the bay floor and see the sea caves. Kit’s Corner: OK, is there anyone out there who might like to take my spot for a few days? His “corny” humor, along with his “strict adherence” to schedule occasionally gets tiring. Seriously, we are having a great time. At least we can make decisions “on the fly” since we aren’t tied to a set schedule. Loved St. Martins! A beautiful little village, very nice local folks and the BEST seafood chowder ever!!! 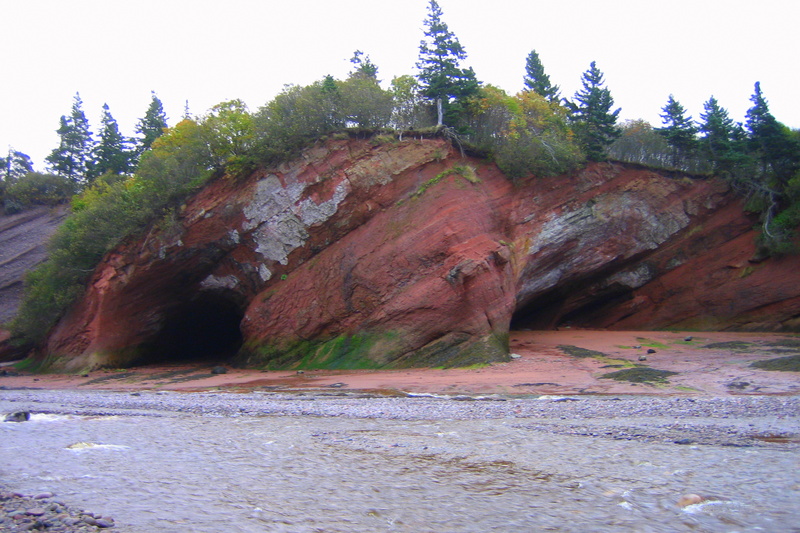 Heading for Fundy National Park in the morning…..stay tuned. Bill, you made me laugh and smile..which isn’t always easy to do when I am at work! Thank you for the beautiful pictures!!! Stay safe and have an enjoyable trip!! Kathy, I will take your place – just have to come get me. Keep it up and keep writing. Remember, New Brunswick is my family home country. Just in case – Newcastle is the “home town” of my paternal grand parents. 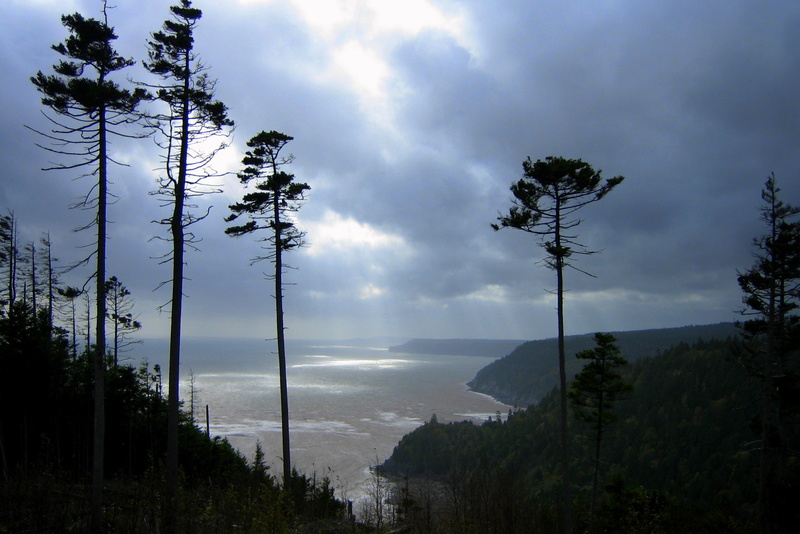 Again, thanks for the memories…we traveled the Fundy Trail on our honeymoon (and also Fundy National Park). I took lots of pictures (with my old Mamiya Sekor SLR film camera) only to discover that instead of a 36 exposure film, I HAD NO FILM IN THE CAMERA!! And Sterlin wasn’t willing to retrace our steps…LOL. Glad you have pics.